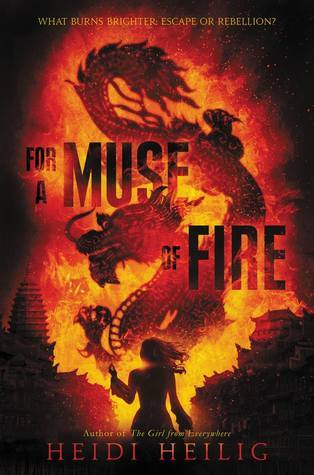 For a Muse of Fire is an interesting story, that blends together political alliances and magic. Chakra is a land in turmoil. Conquered and colonized by the Aquitans, all magic has been banned. It’s interesting because the decision to ban magic comes from a particular character Le Trépas, who as a nécromancien. He took power in Chakra wrecking his own special havoc. Most of what happens in the story is rooted in the politics of the nations. From past to present and what the choices of both sides have lead to. Jetta is definitely a strong and independent girl, who loves her family above all else. She comes from a family known for Shadow Plays and after surviving a fire, has a unique ability. Tied to magic, she lives a life of “Never Show, Never Tell” in order to stay safe. Her family, however, is trying to find their way to a spring to specifically cure Jetta of what she refers to as her “Malheur”. This is the spring that the “Mad King” bathes in. At first I wasn’t realizing that she was talking about mental illness, I thought she was talking about her magic abilities. Which I’m still not sure if she was meaning to cure herself of both. I really enjoyed her character. She felt real to me. I loved Leo. He is such an interesting character because of the way he deals with his strife. He is constantly propelling himself forward. Even though he has a pretty bad relationship with his father, I like how he doesn’t immediately count out his siblings. Even though it might be a thin bond. He has a great deal of compassion and love for others around him. He never felt nefarious even if he might not always be giving of information. I felt like I wish we had gotten more of the Boy King and his motivations. I’m assuming the next book will definitely have more of what he is about in it. The story is told in an interesting way. A combination of Jetta’s perspective and telegrams and letters. This way we are getting two different views of the events happening. Sometimes I felt a bit confused by the French words mixed in. I figure that was really just me though. I loved also that there are songs included. I kept thinking, wow these are so good, I’d love to hear them sung. I like the journey they take in order to try to reach their end goal. I enjoyed the settings and the descriptions and stories of the Shadow Plays. I really enjoyed For A Muse of Fire and with an ending like that. I’m excited to see what the next book has in store.